We are emotional creatures and make day to day decisions based on how we feel. In life though people make real changes when the status quo causes pain, like after a physical trauma, emotional trauma, or potential distress. Occassionally, there are changes due to pleasure, but they are VERY few and far between. It does not have to be that way though, the pain principle can be overcome, it just takes accepting the challenge to become the Better You. After a physical trauma like the pain of cancer diagnosis, heart attack, or diabetes determination a change is demanded or death is the result. There is a well established outline of what will cause all of these maladies and it is what is put into the body, junk food, fat food, no exercise, and lack of nutrition will guarantee the result. It does not get easier to turn away from items and actions, but the ability to say “no” gets stronger. When emotional trauma from the pain of teasing, eating disorders, or physical comparisons mount to the point of creating a bad personal image the result is a continuous internal and often invisible grating. Most cases it is subtle, but definite to you. It takes discipline to recreate the body image and support to maintain accomplishments, getting stronger than the words and pictures. Then there is potential distress from the pain of what may or may not come, the possible diagnosis if habits do not change, the possible anguish of what some may say or do, and the little hater voice in the mind that inspires doubt. These are the best to have to deal with because the results have not come to fruition. All it takes is turning obstacles and habits around to establish a pleasure principle instead the pain that comes with inaction. With all this keep in mind that the pain does not necessarily go away. There are echoes of it from that little voice in the back of the mind, but as you become the Better You, you just get stronger and move past obstacles and those people that said you could not do it. 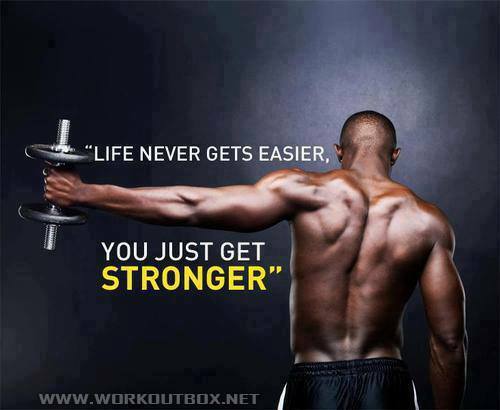 Get STRONGER! Be the Better You! Nothing in life is accomplished without pain and inner strength comes through two types, one that will cut through or the other that will continually cut you. This pain stems from the discipline that slices through mental baggage holding on to laziness keeping success at bay. When not allowed to develop the blade curves in and creates the regret that constantly cuts internally like a thousand pin pricks. Suffer only for discipline that will make the Better You. Suffering is temporary and is all in the mind. It is the result of knowing what should be done and struggling with the baggage of laziness weighing down action. Discipline is the process of slicing through excuses and obstacles. So what if the body is tired! So what if something inconsequential is missed! So what if a sugary tart has to be disregarded! There is a goal in mind and it must be achieved, in fact it is even a greater achievement when more excuses and obstacles are cut away! Discipline cuts inwardly when success is not sought after becoming regret for half hearted actions that one can do, but simply does not for lack of inner strength and further when it is not even attempted becoming disappointment for letting shear laziness inhibit success. This pain is lasting and continuous. Get out there and slice and dice any excuses or obstacles! For there is greatness in the whole hearted and valiant attempts and even more in fantastic achievements along the way! Become the Better You!